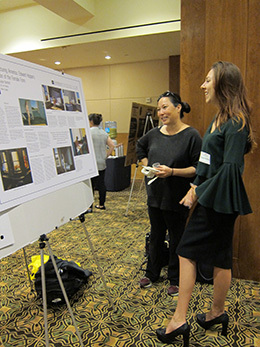 Students in the Junior Seminar participate in the annual Chapman University Student Research Day, creating posters that display their research and networking with students from across the university. Throughout the academic year, students get involved in exhibitions and events around campus, getting hands-on experience with art world logistics. The senior thesis is an advanced research and writing project for qualified senior art history majors on any topic of special interest within the discipline of art history. The student identifies a research problem and constructs an original argument based on research and visual evidence. The final project should show a command of the relevant scholarship, a clear grasp of visual analysis and the ability to construct and defend an original thesis on the basis of these skills. 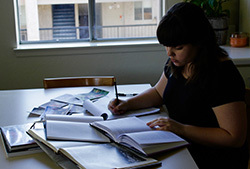 Each student chooses a faculty member of his/her choice to supervise the thesis. Alphonse Mucha earned his fame from his commercial Art Nouveau posters and prints and it is for these works that he has been remembered. Alternatively, Mucha’s Czech nationalist and Pan-Slavic artworks were virtually unexamined until about a decade ago when they began to resurface. Mucha developed his aspiration to create monumental, politically charged public art when working on the interior decorations for the Bosnia-Herzegovina Pavilion at the Paris 1900 Exposition Universelle. Then in his murals for the Prague Municipal House (1910-1911) he further explored how to communicate his balance of political ideologies. Finally, in The Slav Epic (1911-1926), Mucha tried to unify and elevate the Slav people by presenting their shared history and culture and developing a distinct Slav national style of painting. As an expatriate living outside central Europe, Mucha’s sense of reality turned into nostalgia because he was unaware or unwilling to accept that the Czech lands he once knew and the Slav culture he identified with had changed. Therefore, the concepts he presented and the style of painting he used in The Slav Epic were perceived as outdated by the Slav people in the rapidly changing landscape of the early 20th century. During the years 1939-1945, more than 30,000 pieces of visual art were created by inmates in the Nazi concentration camp and ghetto systems. In looking at art from a single camp, Auschwitz, this project seeks to place these works within an emerging field of an art history that considers how trauma and incarceration might affect experience. In opening up the work to a larger dialogue on the history of artwork created in response to atrocity, it becomes apparent how these works differ from photos, documents of trauma, and from the more familiar visual records of the Holocaust, falling into a new category of the imagery that people create while simultaneously experiencing and witnessing trauma. Within the carefully constructed system of the camps and ghettos, the artists that created artwork were able to give both themselves and their subjects a life, a biography, and a story. While these works on their own cannot give us a complete history, they do provide a way for people in the present to access these events in a tangible way. There is a large gap in both the fields of art history and history when it comes to deeply exploring this art and its significance, beyond general surveys of what was created. In an effort to fill that gap, this project looks into the ways these works fit within the canonical art historical timeline and how these works resemble or differ from other visual expressions by those who experience trauma and atrocity, introducing a new way of looking at the history of the Holocaust. Manon Wogahn: Power and Piety: Examining the Papal Tiara in the Context of the Modern Church. The papal tiara has been a symbol of the papacy since its first appearance around the eighth century. The exact symbolism of the three-tiered crown is unknown; a popular interpretation is that it represents the three divisions of the Christian Church: the Church Militant, Church Penitent, and Church Triumphant. Also called the triregnum, the tiara was last worn in public in 1963 by Pope Paul VI, who later donated his crown for charity. Since then, the last four popes, including the current Pope Francis, have received tiaras but have never worn them publicly. This project analyzes the rejection of the papal tiara and of the coronation ceremony as a symbol of the changing values of the modern papacy relationship between the disappearance of the papal tiara and the changing values of the modern papacy after the Second Vatican Council (1962-65). By examining the history of Paul VI’s crown within the context of a centuries-old tradition, I show how the papal tiara has been transformed from a symbol of the pope’s temporal power into a representation of material wealth that has become incompatible with the image of modest piety promoted by the contemporary papacy. William Morris is widely known for his critical views of modern society and passionate distaste for capitalism’s exploitation of the working classes. While it’s acknowledged that Morris sought to offer a socialist alternative to the capitalist system of production by resurrecting pre-industrial manufacturing models, this sense of political purpose has not been extended to the composition of the designs themselves. This paper explores the idea that Morris’ patterns are an extension of his ambition to inspire discontent and openness to change by introducing a different perspective of time and history. By incorporating a balanced harmony of chaos and structure, Morris’ patterns disrupt the viewer’s tunnel-vision focus on the present, allowing him or her to freely imagine a contrasting alternative. This project’s critical focus on the effect that Morris intended his designs to have on the viewer challenges the typical distinctions between his political and artistic interests and sheds new light on his belief in the revolutionary power of beauty. Symbolism was an artistic movement during the late nineteenth century that used mystical subject matter to explore the unknown forces possibly existent beyond practical knowledge. Because of their transcendental interpretations, Symbolist works are often misinterpreted as purely imaginative with little to no engagement with scientific reasoning. Yet, at the heart of Symbolist ideology was the ideal union of opposing forces—an understanding that the many differing parts of the world function in a holistic manner. Symbolism appeared in an era simultaneously experiencing the cultural effects of the scientific revolution and the golden age of astronomy. Given that astronomy is where the physical sciences intersect—where chemistry, biology, physics, along with complex mathematical systems, operate simultaneously to animate the universe—the many astronomical discoveries that took place during this period became an ideal mode for Symbolist inquiry. This project explores the connection between rapid advancements in astronomy and the Symbolist artists’ interest in celestial light as the driving force of existence. Celestial light, more specifically astral light, describes light emitted from the stars that makes biological life, knowledge, and progress possible within its reach. Dissemination of astronomical knowledge into the public sphere is pursued through the work of astronomers Count Francois Arago and Camille Flammarion. While Arago initiated public interventions with astronomy, it was Flammarion that interpreted the stars in a way that inspired Symbolists to further investigate the inner workings of the universe. Using images created by Symbolist artists active in various parts of Europe after 1870—Odilon Redon, August Strindberg, Jean Delville, and Edvard Munch—I argue for a strong tie between science and Symbolism. The Bagan Archaeological Site in Myanmar is the largest assemblage of Buddhist monuments in the world, totaling 3,822. One of the major temples is Sulamani Temple, also known as the Museum of Paintings. Research has emphasized the archaeology of the site and preservation of the monuments as structures, but surprisingly little information is available on the religious role of the painting within the temple. In January 2018, I traveled to Myanmar to document the temple. After photographing all the images within the temple, I created the digital interactive site SulamaniTempleInteractive.com along with a digital database as a way to more fully examine how the Buddha and his life are depicted in Sulamani Temple. Of the 143 images I captured, the site examines twenty five in depth, tracing common iconographic features in the paintings and their grouping within the temple’s interior space, in an effort to understand how the space and its images are used through circumambulation. My research concludes that a distinctive Bagan Buddha was developed by the 18th century in Sulamani Temple, an active Buddhist site where donors frequently commissioned repainting of the principle Buddha images. Pablo Picasso. Artist or Politician? Laura Bjorstad: Art Authentication: A Matter of Science versus “The Eye"